BA (Hons) Architecture student Andrea Radford was awarded first place in the 2016/17 Feilden+Mawson scholarship award, and will receive £1500 to assist her in her final studies at NUA. 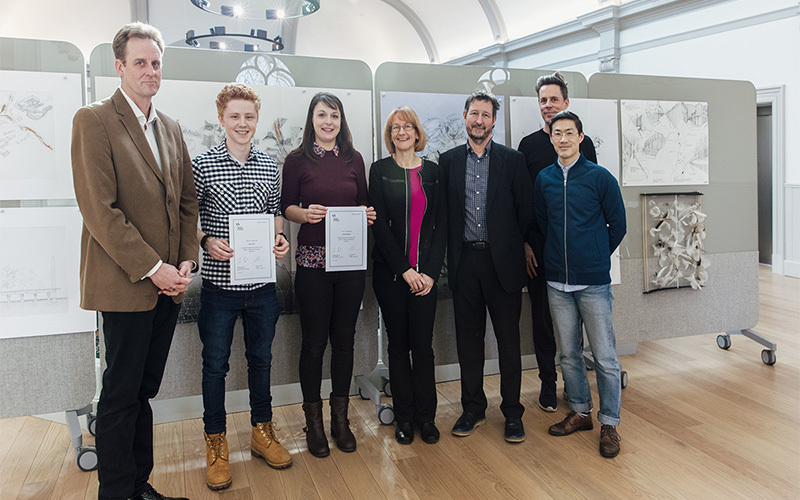 Second place was awarded to Isaac Read, third year BA (Hons) Architecture student, who will receive £500. As part of the selection process, each candidate were required to present their final year project to the judging panel consisting of Philip Bodie and Stuart Jones, both partners at Feilden+Mawson, alongside Hilary Carlisle, Dean of Design & Architecture. The judges thought that “Andrea’s premise and idea was a powerful one that seemed unique and appropriate to the cultural friction in Belfast. We liked the idea of supporting the maternal influence and thought it was an insightful approach”. The judges said “Isaac’s subject matter, one that sought to provide accommodation in a bid to normalise homelessness was a very interesting one. It was clear that Isaac will try to ensure that the building does not become just another shelter which may create a ghetto or no go area in a city which is already not short on these”. The judging panel were impressed with all candidates, and said “We were genuinely impressed with the overall quality of the work presented and the confidence displayed by all candidates. It is also an encouraging sign that the next generation of architects are starting on a firm footing”.